really don't like the "history made" wordmark. It looks like its supposed to be read "18 made". I bet next season their Twitter account will call these uniforms the World Series Blues. Aw well. At least they got rid of the socks logo hat that used to go with this uniform. I think that’s a perfectly fine looking hat for a fan to wear, but it just didn’t look right on the Red Sox on the field. I feel like this was posted verbatim minus the first line blurb earlier in this thread . 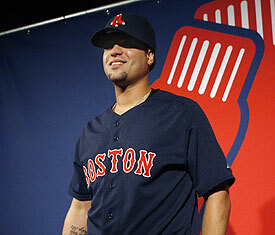 That said, I liked the hanging sox logo hat as an alt for these uni's. It makes sense for an alt obviously if worn with the regular white/gray it would look terrible. My apologies 63bulldogs63 I may have missed that.